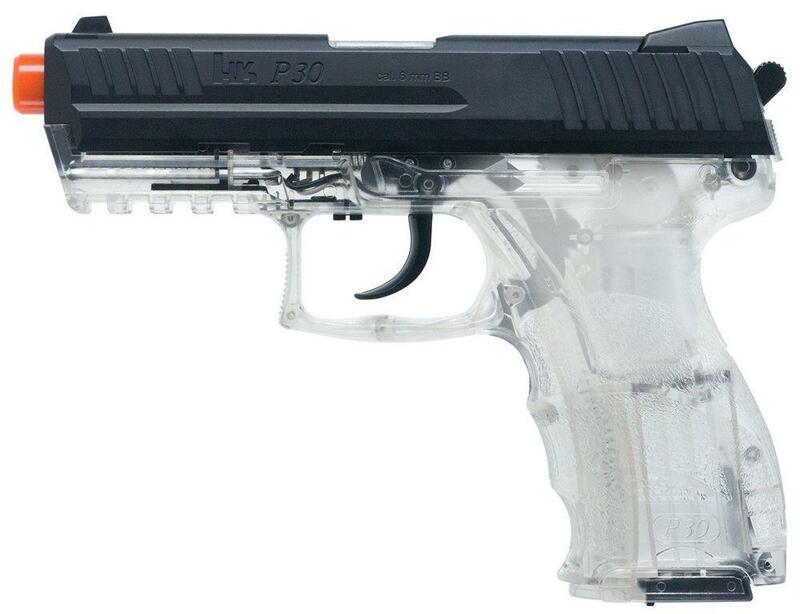 Heckler and Koch Clear P30 Spring w Metal Slide Airsoft Gun | New Website! Trigger Pull: The single action only trigger pull on the Umarex P99 Compact Clear Spring Airsoft Gun is a bit heavier than I expected since generally speaking single action triggers simply just need to release the hammer or striker. There is a little bit of take-up initially but then the release is fairly crisp, just a tad firm but since this is not an action shooter and a full rack of the slide is required to pre-charge the internal spring, having a heavier trigger pull is not a big deal and did not seem to effect my accuracy in any way. Accuracy: I didn't get a lot of shooting time with the Umarex P99 Compact Clear Spring Airsoft Gun but I can say it seemed to be shoot fairly accurately. I tested it out shooting on a paper target from 20 feet back using a non-rested standing position. The Umarex P99 Compact Clear Spring Airsoft Gun did shoot a bit high and to the left but my 10 shot grouping was within 44.5 mm (1.75 inches) with the exception of one stray that shot a little more to the right. I was using .20 g BBs but they did seem to get to the target pretty quickly and penetrate the paper fairly well. I would say they were traveling well over 200 FPS. Build Quality: The Umarex P99 Compact Clear Spring Airsoft Gun is about a $25 gun so you can't really expect too much in terms of quality materials but that said, the gun does feel solid and well put together. I had no issues shooing it and for the price you should get plenty of good use out of it. 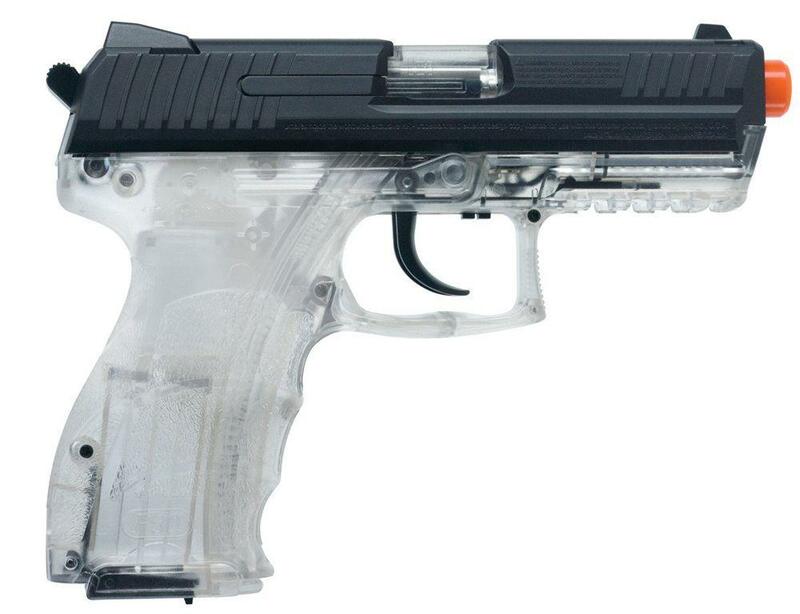 Realism: The Umarex P99 Compact Clear Spring Airsoft Gun is realistic in terms of its shape, operation and even the Walther P99 licensing and trade marks. But as is expected being a clear plastic gun it falls short in terms of feeling and looking the part of a real gun. But that's kind of the point here, this gun is supposed to clearly look like an airsoft gun and not a real gun, including the orange red tip. Comments: Right from the get go I was not expecting much from the Umarex P99 Compact Clear Spring Airsoft Gun. I am a bit of an airgun snob and personally tend to stay away from the likes of these clear plastic non-blowback super low cost airsoft pistols. But after playing around with it for a bit I could really see how a first time airsoft buyer could really enjoy the Umarex P99 Compact Clear Spring Airsoft Gun. It shoots just fine and costs next to nothing to buy and shoot. And I know there are many younger folks that watch my video reviews and perhaps their parents may be sitting on the fence about allowing them to buy an airsoft gun out of fear that so many of them look so real. The Umarex P99 Compact Clear Spring Airsoft Gun clearly looks like an airsoft gun which makes it pretty hard to get in trouble with, yet you can still enjoy the airsoft shooting experience without freaking your parents out!